Below are the standards as set down by Erich Thomsen and William "Bill" Daney in the late 1950s. 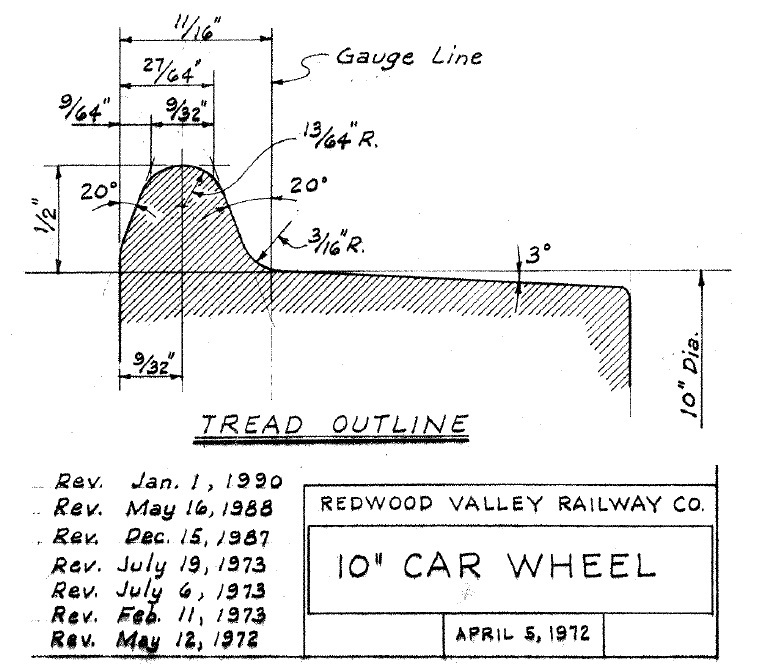 From these standards was born the Redwood Valley Railway at Tilden Park in Oakland, CA. and the Paradise & Pacific in McCormick-Stillman Railroad Park in Scottsdale, AZ. The partnership struck was for Erich to design the locomotives and Bill would design cars. The designs and patterns these two men made back in the 1950s and 1960s are still used today to build new 5" scale / 15" gauge equipment. Since inception these standards have been adopted by many other railroads including, but not limited to; Glenwood, South Park & Pacific (private), Joshua Tree and Southern Railroad Museum, Hetch Hetchy & Yosemite Valleys Railway (private), Reedyville Railroad (private), Trinity Apls Railroad (private), Arborway TT & North Western Railroad, Coyote Valley Railway (private), Orland-Newville & Pacific, and of course our own Hillcrest & Wahtoke Railroad. Equipment can be taken from any one of these railroads and put on another and they will couple up and work fine together. This is the track standards sheet we use for our own railroad which covers details needed for working with earth movers and soils engineers. The notes on the compaction of the subgrade are very important as they directly relate to maintenance costs. Laying track directly on the ground is a great way to save installation costs and to get the railroad up and running in short order, however as the track settles over time regular and labor intensive maintenance will be required. A well-compacted subgrade with provisions for drainage will save a lot of labor in leveling track and replacing ties rotting from water damage. In Jan 2016 the average price for track laid to the standards outlined above was $50 per linear foot. That's rail, joiner bars, bolts, spikes, ties, compacted subgrade, ballast, fully installed and ready to run on.